Many of the old preset lenses by Vivitar, Soligor and Spiratone, etc., have a similar type of iris and these are frequently out of kilter with blades going every which way. The cause for the problem is that the iris has instead of pivots, little vanes that are at right angles to the iris blades that fit in slots in the moving plate. If the iris is stuck with hardened oil, the vanes get bent and come out of the slots. you need to bend them back to the correct position. Unfortunately the lens has to be completely disassembled to get at the iris. Unscrew the rear element group as an assembly (mine was a single element). 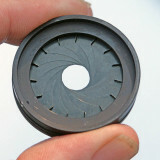 The Aperture ring has a long screw that passes through the body tube to the iris. You need to unscrew the fine threaded helicoid ring to remove the screw. The ring has a left hand thread. Mark its position just as it releases from the body tube, remember that it has a left hand thread on reassembly. Mark the position of the moving and fixed plates in relation to the body tube. Bend back to right angles any bent iris blade vanes.